…picture to follow, hopefully Friday. We felters may feel kinship with shoemakers, in hoping that elves will appear in our workshops in the middle of the night and complete our work. Barefoot elves with soaped-up feet, sliding across the surface design of an intricate scarf, getting those wool fibers, one-by-one, to meander through each other and through silk fabrics. How many elves, I wonder, would it take to bubble roll an eight foot by ten inch, soaking wet scarf, with fringe and tendrils of hand-spun yarns and ribbons of hand-dyed silk? I do wish that the scarf-in-progress that waits for me in the studio could felt itself, at least a little, because I have so many sketches and ideas to develop, as well as commissions to complete. The sages taught us to ask a Higher Power: “Teach me to number my days, that I may attain a heart of wisdom.” An artist might amend this quote: “Teach me to number my artistic creations, that I may cherish my studio time and appropriately value the work I do.” Amen. I started making what I called “Antidote” scarves during the flu hype two years ago, as a way to express and work through my anxiety. 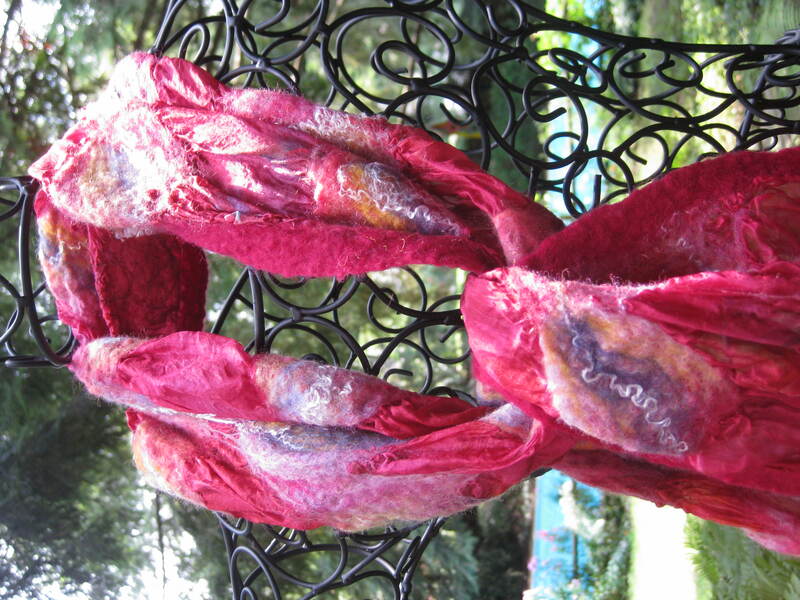 Each scarf was completely different, vibrant, with uneven and burnished-looking edges, silk fabric placed on patterns made of prefelt shapes creating highly-textured areas, and with designs flowing right off the edges. 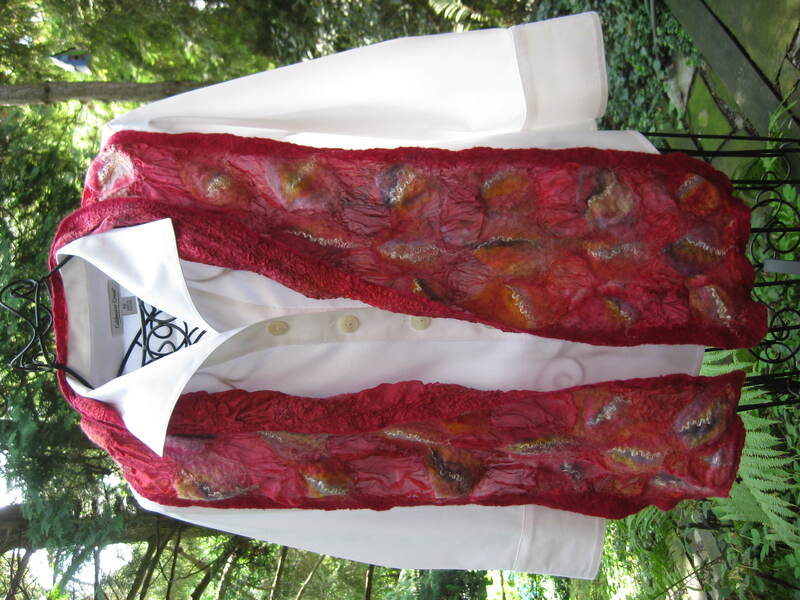 Sometimes I grounded the overall design by using an earthy-colored background for the top layer of the scarf. Today, as I worked on preparing the studio for a felting session, I thought about the idea of “a living wage” as it relates to artists. I felt so fortunate to be home: my grandchild napping nearby, Elsa the dog snoozing in the studio. What is fair compensation for work this pleasant, done in the comfort of home? What do artists need…? Do artists who work slowly on one-of-a-kind pieces have different needs for compensation than those who prolifically produce many, many works? I have no answers. In general, artists need what every other person needs: security, with regard to health care and food and shelter. So many artists craft and barter their way to a beautiful life; and for many of us, there is less need to “escape” monotony or drudgery of the work life. 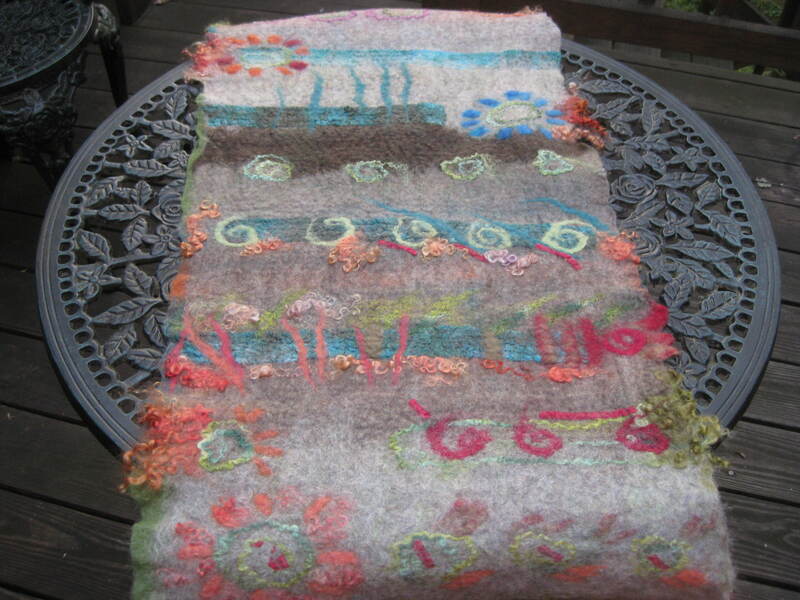 Many artists weave work and social time, travel and adventure and play time together. But… work is work; and artists do not have more time than others to accomplish what needs to be done in one day or in one life. The world needs art; and artists know when the work they are doing is consistent with what the world needs: it is not a “created” need, as in advertising. We listen with our ears, and our hands and eyes and spirit. Sometimes affirmation comes in the form of sales and commissions, but this does not necessarily help us do the work that is consistent with our deepest longing or best ability. Success is a jumping off place, not a place to put down roots. What do artists need? I suspect that what we need the most is freedom. Why do so many people love polka dots? We put them on children’s clothing, umbrellas, scarves, ties, skirts. Somehow, polka dots make us happy. An intentional pattern of dots is a design that’s simple to comprehend, energetic, whimsical and upbeat, bold but still contained. Sort of like the polka dance itself. Unlike organic patterns that have variety, the standard polka dot is a regular, predictable, all-over dot. It’s exuberant, but still tamed. I noted in a fashion article that polka dots are a popular motif for the new season. Not trendy about fashion myself, my response to learning about a trend is NOT to buy an item in the trend but to wonder why, at this moment in our culture, this particular trend has become popular. We return to the past to figure out the present, and the present is difficult for so many people. So we’re drawn, once again, to the whimsical, smile-inducing polka dot. When the choice is possible, choose happiness. 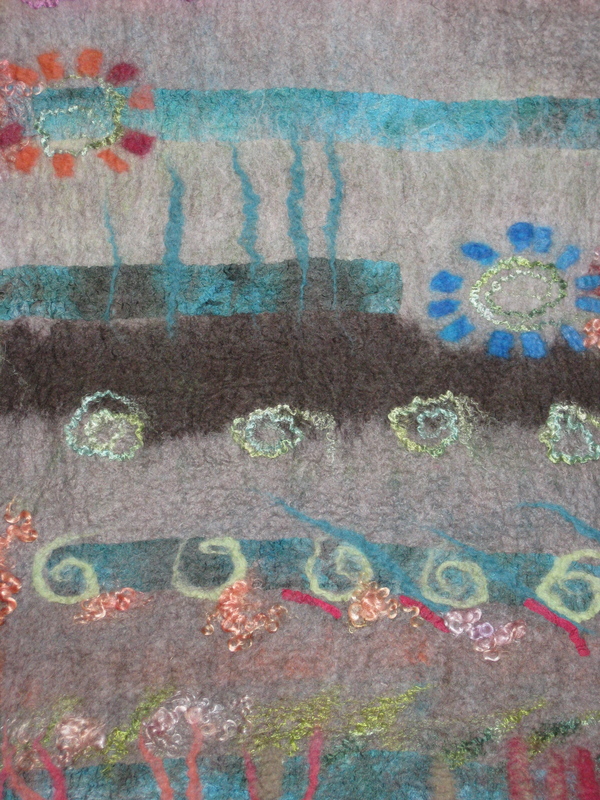 Two Images of Felted Yardage, Un-cut! I started my art career as an illustrator: cartoonist for my high school and college papers, and then professional illustrator, always working in pen and ink, sometimes by candlelight. When the bottle of India ink got low and I opened a new bottle, I’d pour the new bottle into the old and shake it gently, because that old, slightly thickened ink had a wonderful consistency and richness. Back then I worked carefully, because a drip or misplaced line could ruin a drawing. Now, with computers, there are no mistakes that cannot be fixed. As much as I loved drawing, I hated drawing on computers. It felt unnatural, like kissing someone through a computer screen. Now I enjoy the ancient craft of feltmaking. It’s very low tech: I layer wool and other fibers, wet them and roll them and basically agitate them into shape. I don’t use any gizmos other than household/kitchen utensils: bubble wrap, rattan blinds, old towels, a ladle, a slotted spoon, a whisk, the legs of nylon stockings to tie up the rolled fibers, tiny wooden skewers with which to craft detailed work. I’m so in love with this physical, labor-intensive craft. Now I need to take this relationship to the next level. I really want to try to share/sell work online, via etsy.com. I am on a new-to-me computer, just learning how to implement its bells and whistles. 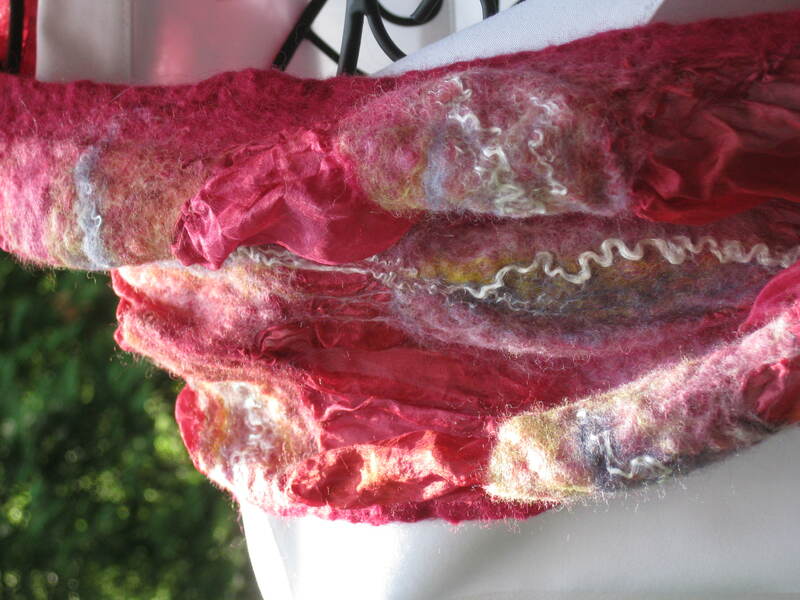 My approach to feltmaking could be called “metaphysical” in that I seek to imbue my work with a spiritual quality or with some essence of nature that might transcend the material and give the viewer/wearer a direct sense of nature. It seems strange to photograph this work, transfer the images onto a computer, and send it into cyberspace — this work that’s so close to my heart. I am thinking of this etsy.com venture more like opening a tiny gallery shop, and seeing who might stop by. Years ago, I found some vintage fabrics online. There were images of the fabrics, which were lovely, and a phone number — but no way to order online. When I phoned the number the owner said she wanted people to call her to order so she could ask them “What are you going to do with the fabric?” because she really wanted to connect with her customers. This makes sense to me as an artist. In the coming weeks I’ll seek to balance the very slow, low tech of studio time with the possibilities of a fast computer and the vast potential of etsy. I can feel the part of me that just wants to sit by candlelight in the solitude of the studio, like a monk working on an illuminated manuscript in Latin; and I can feel the part of me that wants to become fluent in the language of technology. While I hope to set up a virtual “shop” on etsy.com, I’ll also be dedicating part of a studio space in my home for an actual little “shop” area where I’ll organize the work offered on the etsy site. In this way, high-tech and low-tech can co-exist. I’d love for those visiting my etsy site to feel like they are beng warmly welcomed to visit my studio. If your psyche — vast and complicated — was a city, how would you choose to get from once place to another? Would you wish to be blindfolded and put in the trunk of a cab and driven there, or would you rather walk? If you walk, then you will be able to find your way back and you’ll gain understanding of the city’s details. We can speed blindly from place to place, and somehow think we will evade the anxiety of the driven life; or we can slow down enough and be reminded of what well-being feels like. We can navigate our way on our own and at our own speed. Body work like massage, yoga, tai chi and reiki are good ways to remind our body how it feels to be safe in ways that allow us to trace the path again and again. We choose to control so many things about our lives and so often overlook controlling our own attitudes. On ordinary days we could choose to be so much more joyful, and instead we take our to-do or to-be lists, forge a sword of Damocles and hang it over our heads. It was an excellent plan: I would felt a large piece of yardage on which I’d experiment with some of the patterns, colors, fibers and motifs that have been on my mind. Once dry, this yardage would work well cut up into cards, cases, small hangings. In the busy days of company here, students moving into dorms and apartments, and helping to care for our granddaughter, I’d have an assortment of work to do in the minutes here and there, embellishing and finishing these small projects from the yardage. Great! I completed the yardage, staying up late in the night and enjoying the quiet, cool studio. When it dried, I could examine what worked well and how I’d want to tweak various techniques and other options, for future work. I couldn’t wait to start cutting it up… except… the piece did not want to be cut up. It worked as a whole piece, and I did not have the heart to start cutting. So instead of a collection of related work, I had one, large piece that insisted on remaining whole. Instead of a week’s worth of hand-work to do, and a nice assortment of new things to deliver to The Gallery Shop, I have one table runner or wall hanging. I turned the piece this way and that, hoping some part of it would yell “Here! Cut here! Great little purse right here!” I could continue my great idea. But the more I examined the yardage, the more complete it looked, whole. I felt frustrated: in those precious minutes here and there in a very busy week, in which I’d have no time for completing much felting, I would also NOT have the felt yardage needed to be as productive as I’d imagined. I felt constricted, stressed, thwarted. But the weather has been cool and fresh and so beautiful, and everyone around me begins to settle into their academic new year groove. Why would I torment myself, beat myself up with this “great” but impossible plan? Time for Plan B. Instead of embarking on new projects from the yardage-that-will-not-be-cut-up, I need to turn my attention to what is possible in the days that are not whole cloth, but are a patchwork of minutes here and there in which to do studio work. This shift in attitude was rewarded, of course, with a shift in my mood, which transformed from frustration and a sense of incompetence (how could I have failed to produce yardage that would be just right for cutting into projects?!) to one of possibility. For sure, there’s other work to be done in small bits of time. It’s wonderful to dream big, to envision abundant studio time and successful projects: this is how artists put one foot in front of the other. But if we use these dreams to beat ourselves up rather than for motivation, we only create additional obstacles to overcome. For today, I’ll be grateful for the work that I can accomplish: repackaging some Rhapsody Rose Corsage pins to include vintage calico fabric backgrounds on which to attach the pin, and assembling some “small stash” bags of various merino & novelty felting fibers (introducing the world to yak, one student at a time!) to sell at this Saturday’s Gallery Shop demo. Instead of the intensity of crafting a variety of new work from the felt yardage, I’ll cut a dowel and attach it to the yardage, and make it a wall hanging so it can be enjoyed. I’m taking care of our little granddaughter, who naps as I type this post that I composed in bits in my mind while on a walk, with Elsa the dog walking gracefully alongside the stroller. Here is the whole cloth of the idea which I hope might be somehow useful. Lots to be done, but at this moment I’m out on the front porch, where chickadees, cardinals (who are being so loud!) and squirrels are stopping by the bird feeder and bath. The air is filled with bird song. Little Camilla, our granddaughter, sleeps nearby in her stroller, one arm cuddling a pink poodle Cabbage Patch doll. Previous generations didn’t call it “mindfulness” or “living in the moment,” those sweet times to sip iced tea in the shade or go for a walk while holding a toddler’s hand or watch a grandchild sleep. First things first, somehow my to-do list will have to reckon with what is possible. On days when I remember to be my own best friend, I write a to-do list that is well within the realm of the possible. The mid-afternoon sun shines through the leaves on the Japanese maple that screens the front porch. Seen from below, the leaves look apple green, chartreuse, fire orange, rose-tinged, cool purple in some shady places. The maple seeds are crimson, jewel-like sculptures, so abundant and so delicate. How does the slant of sun through leaves offer so many different colors? What a puzzle, and what a glorious, sun-dazzled inspiration for a nuno scarf! I don’t know how to manage time or stuff particularly well and I’m not sure how to prioritize my efforts on behalf of a deeply hurting world. But this moment offers a clue: slow down, breathe, simplify, bring this peace and gratitude along to whatever I do. Sometimes a time warp happens just when you need it. How else can I explain how quickly I was able to remove from atop a guest bed (a sweet day bed we use when we need more than two rooms to sleep house guests) the MANY bins in which my beloved fibers are stored. This arrangement works very well when we do NOT have a houseful, since the fibers are safely stashed in large, see-through bins well above the floor, and can easily be reached. Trickier was finding space for recently-acquired mannequins, a display rack, bags of bubble wrap of various sizes… but space was found. Now that the bed is cleared, I’ll make it cozy with soft, fresh sheets; spiff up the adjacent bathroom, and voila! — a space to help make our guests feel very welcome. While dinner cooks I’ll start felting the large yardage on the work table, and sometime tonight when the piece is completely fulled, I’ll hang it outside to dry overnight. Then I’ll fold and stash the studio work tables so I can make up the sofa bed in that room, that used to be the playroom and is now my primary studio as well as an additional guest room. If the gods of hospitality smile down upon me, sometime Friday morning we’ll have well-rested house guests and a household in motion moving four college students from three different families into four different apartment/dorm rooms. If my “strategy” works, I’ll have yardage for twenty small felted cases dry and ready to be embellished and finished, as the dust settles. We shall see. I recently wrote a piece about time management, a piece that might be a ballad or perhaps a lament… Today in the studio, I realize that even if one is not consciously aiming at “a strategy” the resulting effort might fit into that category. So here is my strategy for today: load up your work tables with fiber just before company is arriving. (important note: You must be planning to have some of this company sleep in the as-yet-to-be-transformed studio/second guest room space.) Fill your studio with bits of merino, yak, alpaca, silk, prefelts. On my tables: yardage that will be worked into small cases and table mats. Finally, those Celtic torque shapes are twirling. Now the fun part: you must get that work felted and off the work tables in order to tidy up the studio and prepare for your guests. I am indebted to my house guests for the bounty of work about to be completed. See how motivating this strategy is!